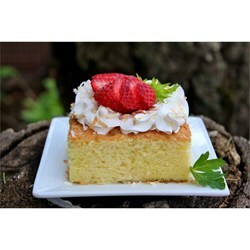 Is a sponge cake soaked in a mixture of three kinds of milk, topped with whipped cream and strawberries (optional). Grease a 10×15-inch baking dish. Beat egg whites in a large mixing bowl with an electric mixer on high until stiff peaks form; gradually beat in sugar until mixture is glossy. Beat in egg yolks, one at a time, combining each yolk before adding the next. Reduce mixer speed to medium and add flour, about 1 tablespoon at a time, to the mixture, beating continuously; beat in baking powder, milk, and vanilla extract. Pour batter into prepared baking dish. 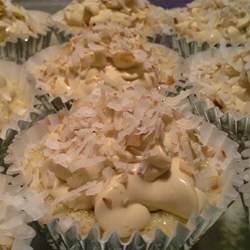 Bake in the preheated oven until cake is lightly browned and a toothpick inserted in the middle comes out clean, about 25 minutes. Let cake cool for 15 minutes. 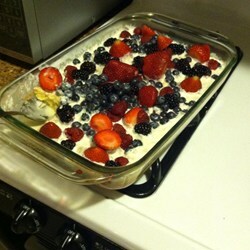 Pour 1 cup cream, sweetened condensed milk, and evaporated milk in a blender and pulse several times until well blended. Pour three-milk mixture evenly over the cake. Refrigerate cake until cold and the milk mixture has soaked in, at least 1 hour. 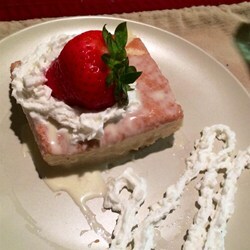 Cut in squares and top each serving with a dollop of whipped cream and a few sliced strawberries. Refrigerate leftovers.